October 21st is my mum’s birthday. After she died in 2003, my brothers and I established a tradition of preparing her favourite dish – coquilles St Jacques – on October 21st each year. It’s become a way of marking the day – and of connecting with one another. It isn’t always possible, but more often than not, we all sit down to this meal on her birthday. Coquilles St Jacques was pretty sophisticated fare in small town northern Canada in the 1970s. Especially when it was served in scallop shells, the way my mum did. While it is traditionally presented this way, mum’s recipe had strayed somewhat from the classical version. 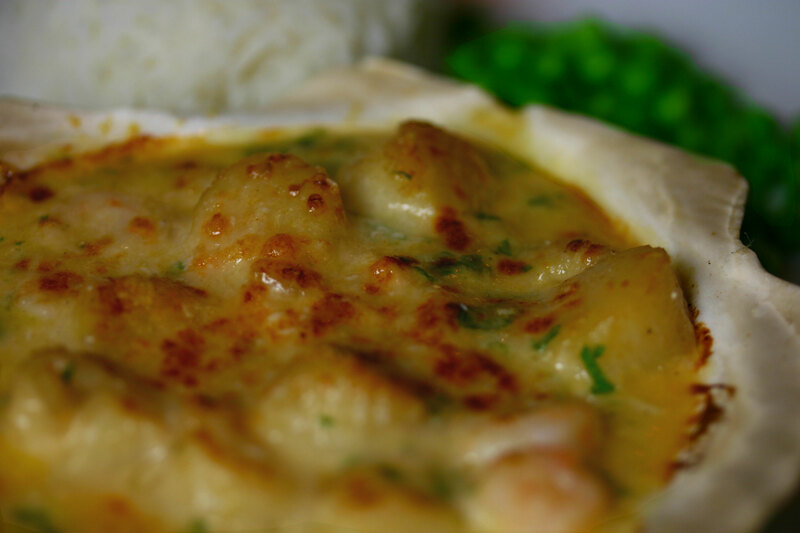 Instead of lightly sauced and gratinéed scallops browned under a hot grill, her coquilles St Jacques is creamy seafood sauce that is ladled over steamed rice. Challenging for a child to eat on a teetering scallop shell. To make the sauce, melt the butter in a small saucepan over a low heat. Add the flour, mustard powder, salt and cayenne and stir to make a roux. Slowly add the milk, stirring all the time to prevent lumps. Cook until the sauce is thick and velvety, then remove from the heat and stir in the Worcestershire sauce and 1/2 cup of Parmesan cheese. Set aside. Pat the scallops dry with paper towel. (If you are using large scallops, slice them crosswise 1/4″ thick.) Season with salt and pepper and toss with the flour, shaking off any excess. In a small frying pan, heat the butter and oil over medium-low heat. Add the onion and cook until softened, about five minutes. Fold the scallop mixture into the sauce and spoon into four buttered scallop shells or small ovenproof dishes. Sprinkle with the remaining 1/4 cup of Parmesan and place under a hot grill until golden and bubbling. I love how all of you, from the Uk, to BC, to Saskatchewan make this dish on this special day. As it turns out I asked (insisted) dad make this as it was Tuesday (our late day & his to cook) so he did the recipe from your cookbook (under minor protest as he hadn’t made it before). My reaction was pretty firm that he “COOK IT-ITS WHAT WE ALWAYS HAVE THIS DAY”. He followed it exactly minus the shallots and used the white part of green onion. He boiled the seafood before adding it as it was frozen. I was there whilst he was doing it and helped, but it was so much like moms that I really found it nostalgic. Good for dad! I’m glad he got past his concern about cooking something new and you guys had your coquilles as well. Our looked a bit different this year, what with being browned under the grill, but the taste was pretty much the same. Easier to eat too when you don’t serve the rice in the scallop shell as well. Andrea, I love your recipe and tradition come with it.. We do the same for our belated beloved Grandmother, I always cook some of her favourite dishes that day, in honour of her.